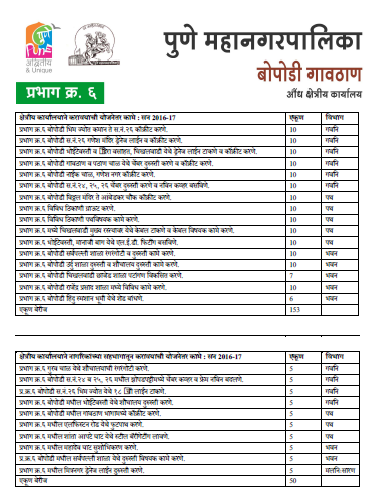 For the 2012-17 General Body, Pune was divided in 76 electoral wards, also called “प्रभाग” (Prabhag). Each Prabhag had elected two elected representatives : one seat reserved for a female candidate, and the other being open to both male and female candidates. Together, our elected representatives form the General Body (GB) in the Pune Municipal Corporation, which is Pune’s urban local governing body. Scroll down to the interactive map of Pune, to locate your ward and view civic information about it. View the status of infrastructure and services in each prabhag and its WISE Index score. Select your prabhag below, or click on it on the map to see its info, wise index values and data. .